Out With the Old Debt, In With the Financial Freedom? In these tough economic times, debts can stack up like piles of bad laundry, with beleaguered borrowers just like you struggling to clean up your burdened budgets. This is especially true for folks who are experiencing a sudden economic setback such as being laid off from a job or an unexpected medical emergency, sending them through no fault of their own into an endless cycle of unpaid bills. But apparently Williams’ “free pass” from paying her credit card debt is an aberration among bill collectors, many of whom could easily take your car, house, or household items— as in the case of Erin Miles—if you’re not careful. Fortunately, a bankruptcy filing can be your first line of defense against a relentless collection agency. A lawsuit usually comes after many months and sometimes years of chasing after a non-paying debtor. 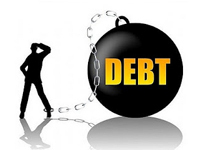 When a debtor fails to respond to a creditor lawsuit, the creditor will win a “default judgment” which will give them the power to take extreme collection actions against the debtor, such as seizing a bank account or garnishing wages….or even seizing assets. But filing a lawsuit against a debtor is not a creditor’s first choice. Creditors know that even if they file a lawsuit, it can be quickly neutralized with bankruptcy. While a creditor who wins a judgment can garnish your wages or seize your bank accounts without warning, only bankruptcy can stop the garnishment or bank seizure order. If a creditor seizes your assets after you file bankruptcy, you have legal recourse and you may be able to get those assets back. Responding to a creditor’s lawsuit with an “answer” will buy the debtor more time to put together more money or to file Chapter 7 bankruptcy or Chapter 13 bankruptcy. So, are you thinking about filing for Chapter 7 or 13 bankruptcy to stave off the seizure of your assets following a stint of unpaid debts? It’s probably best to call the bankruptcy attorneys at the Law Offices of John T. Orcutt who offer a totally FREE debt consultation and now, more than ever, it’s time to take them up on their offer. Just call toll free to 1-888-234-4181, or check them out online at www.billsbills.com.